What does paradise mean to you? If it means miles of powder-soft beaches, crystal clear waters and lush green spaces, you’ve come to the right place. Sail in five-star luxury with Paul Gauguin Cruises in all-inclusive style to Tahiti, French Polynesia and find your own paradise. It’s all complimentary — from meals and drinks to entertainment and water sports. This 7-night itinerary is perfect for those who want to experience the best French Polynesia has to offer in just a week. Aboard the award-winning m/s Paul Gauguin, with only 332 guests, you’ll draw close to the islands that inspired Gauguin, author James A. Michener, and so many others. Call on Huahine, the “Garden Island” … spend a day on our own private islet off the coast of Taha’a … explore magical Bora Bora and bask on our private white-sand beach on a motu off the coast … and discover Moorea, said to be the model for Michener’s Bali Hai. There’s a reason these islands are world-renowned— their beauty is unmatched. 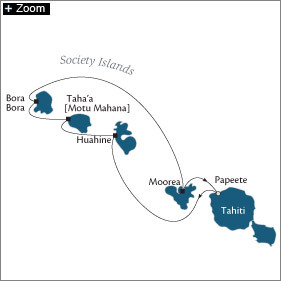 Today, you’ll call on Huahine, known as the “Garden Island” for its lush rainforests and dramatic terrain. While here, you might explore the island’s sacred sites and legendary landmarks that are among the best-preserved archaeological remains in French Polynesia. Enjoy snorkeling or SCUBA diving in the expansive lagoon. Or picnic on the beach. Explore more of this magical isle on your own or on a choice of optional shore excursions. Choose from several, like a jitney tour on “Le Truck,” a 4-wheel-drive safari, or a glass-bottom boat ride. We will set sail before dinner, enjoying a relaxing evening on board. Explore more of this peaceful oasis. Perhaps you will choose to trek on the “Trails of the Ancients” or snorkel one of the world’s most beautiful lagoons. At the end of the afternoon, we cruise to our home port in Papeete, docking for the night. Cap off your epic journey where it all began. You won’t be the same as when you first set sail – these exotic isles are said to touch people in magical ways. If you want to explore more of this side of paradise, perhaps you will choose our pre- and post-cruise hotel programs in Bora Bora, Moorea, Taha’a and Papeete. Complimentary beverages including fine wines and premium spirits, soft drinks, bottled water, coffee, and tea served throughout the ship.